Happy Thursday! Can you believe Thanksgiving is only 1 week away!? It came so quickly. I'm ready for the holidays though and looking forward to spending time with family and friends...and for good food, of course! Today I'm styling a Thanksgiving outfit idea. The color scheme isn't what I would normally go with for November (I typically wear shades or red and orange this time of year), but I thought blush would be fun for a change! 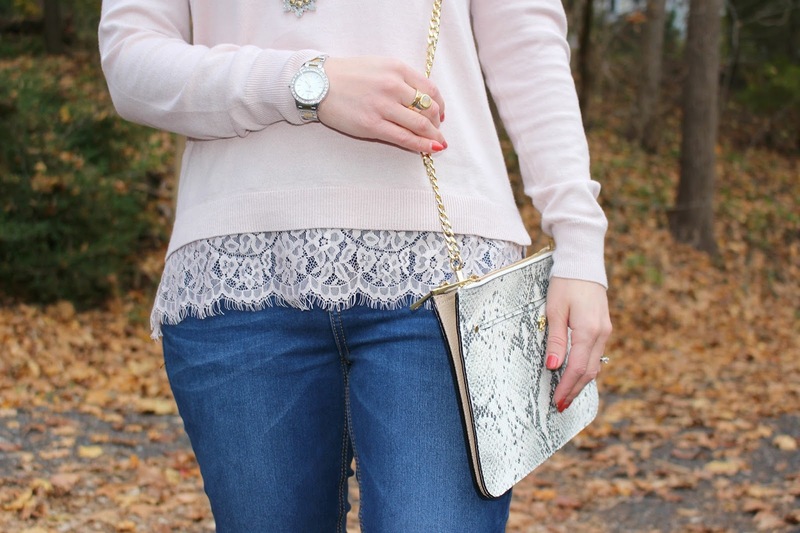 This lace trim blush sweater is from the Ann Taylor Outlet. The color and lace detail make it so pretty and feminine! I linked a few similar sweaters below. This is a popular sweater style right now, so there are lots of options out there! I have always loved light pink/blush and gray together! Gray is less harsh than black, so it keeps the color palette of this outfit soft and girly. 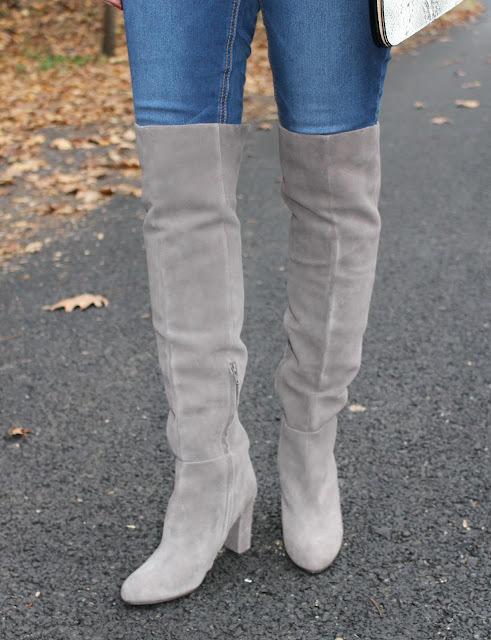 These Halogen over the knee boots are absolutely gorgeous and make your legs look so long! They are currently on sale for $129.90 (30% off) at Nordstrom and come in black and burgundy, too. Hurry, sizes are going fast! For accessories, I went with a gold/silver jewelry mix. The hardware on my crossbody bag is gold, so I wanted to keep gold in my jewelry. I have been wearing a lot of two tone jewelry lately since those pieces are so versatile. My Fossil watch is two tone and goes with everything! I definitely recommend this watch and it makes a great gift. My necklace is Lucky Brand and I found it at T.J.Maxx recently (also two toned). Any long necklace pairs well with a sweater like this. 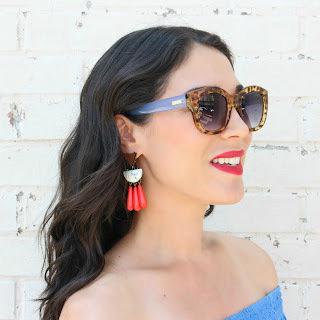 These Stella & Dot ear jackets make the perfect gift for the upcoming holidays! They can be worn 4 ways and have interchangeable studs. I wore the blush studs for this outfit to match my sweater. I think they tie in perfectly with the soft, feminine feel of this look. This outfit is so easy to recreate for Thanksgiving or any other time this winter. Just pair your favorite sweater with tall or over the knee boots, add some fun accessories, and voila, easy and fashionable!